I saw a few pics of my car on this site so I figured it was time to join. I belong to a few sites so I will join in when I can. This is my 1970 Plymouth GTX. Its a numbers matching 440 4bbl car. I have added a few go fast goodies including a six barrel which I have always wanted. It has the air grabber hood, Hood mounted turn signals (they work), and of coarse the factory "In Violet" aka 'Plum Crazy' exterior color. Looking forward to talking to a few of you in the future!!!! Nice looking ride mate!! Where are the turn signals in that photo? I can't see them......or am I blind? No, your eyes are propbably just fine. You have to be sitting in the drivers seat to see them. They are on the hood, left and right of the 440 callout in this pic. Your car looks mint mate, what is it? Class 1 or 2 show car? Its clean but nothing that would win a Gold Medal. A '2' at best!! 2, that's clean enough for me mate!!! Looks good bud, welcome aboard. Welcome to the board FC7GTX! You have a beautiful car there! Welcome on board! You car looks sweet!! I think you'll find this is a great place to hang out and enjoy some friendly MOPAR people! Enjoy! Good to see you made it here Chris. Guess I'm one of the guilty ones who posted some pics of your car, but I didn't think you'd mind. This is a pretty friendly place to hang out, and they even welcome us B-body guys as part of the family! I don't mind if anybody posts pics of my GTX. I have a big collection of other mopars that I save and enjoy on my hard drive. I'm a bit taken back by the attention the car gets but I enjoy the car and if others like it then thats ok with me. Welcome to the site, FC7GTX!! That's a very nice car you have! Welcome FC, so you`re the lucky one who owns that awesome GTX wich been pictured at C-C.com. Welcome and awesome GTX there!I have a `70 road runner also originally FC7.It`s just a stripper 383 car,bench seat and Go-wing but I might add the air grabber if I can find one cheap enough. Welcome to the board Chris, Very nice X you have there. Thanks guys for all the kinds words and comments!!! 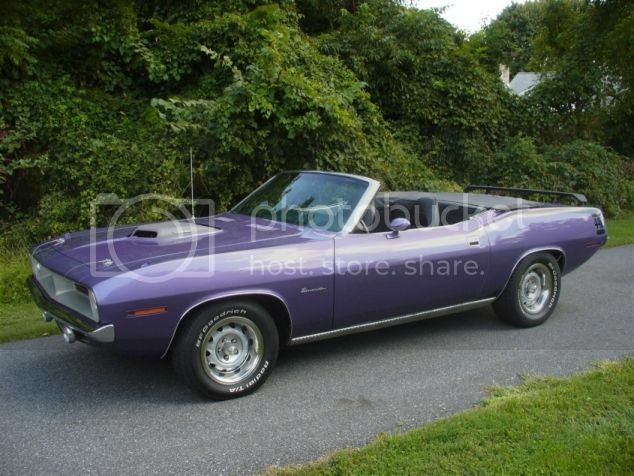 Since this is a Cuda Challenger site I will have to show my only E-body that I owned. It was a '73 Challenger 340 4bbl 4spd. I bought it in high school and was my daily driver along with my '70 Road Runner. I alternated driving them to school. Those were the days!! !